It wasn’t supposed to be, well, “easy,” not exactly. I mean, moving into an isolated, 10,000 square foot fishing lodge in the backwoods of Alaska isn’t for the weak of heart or soul. But when you inherit a good bit of money, just enough to buy your dream, it is hard to think about all the things that can happen when you are a 6’4” woman with orange hair, huge feet, and a childhood wish to run a back country fishing lodge. So, Blaze dove in, monster feet first. But, well, yeah. Stuff happens. “Stuff” like your handyman suddenly turning into a were wolverine and attacking not an hour after the bush plane drops her off on the banks of Lake Ebony on the Yentna River. Yep. Things are going downhill from here, toot sweet. Oh, werewolves and wolverine, dragons and Thunderbird and, well, you get the point. And baby, “Something Wicked definitely this way comes…” But, darn it, this is HER place – even if a curmudgeonly, foul tempered, bad mouthed wolverine IS accusing her of being some kind of fantasy creature bent on elbowing in on “his” territory. Hey, she has the proof of her ownership of those thirty acres in her safety deposit box! Jerk. I was truly surprised and thrilled to find a new-to-me author I am now so enthralled with. Alaskan Fire is a new sort of beast. A fantasy/paranormal with new and fascinating world and character building. Yes, there are the “standard” list of fantasy characters. Weres and dragons, etcetera. But done with an interesting twist of characterization and storyline that created a book I honestly couldn’t put down. And rather than gulping the book in huge bites, I savored it, taking my time and learning to love a couple of pretty unusual oddballs. Let’s face it. Jack the wereverine is someone that I would normally absolutely “despise” in any other situation. From the first, I hated him. I mean really hated him. But stepping back, I began to learn who he was, deep down. All the millennia of being alive, through a time when man was barely walking erect, through the Bronze Age, the Iron Age, and beyond . . . centuries without measure, filled with love and loss and more pain than any one creature should be forced to bear. Yep. Jack is a piece of work. And before it was over, well, I may never be a charter member of the Jack Fan Club, but I absolutely want to continue the story. Because this? Well, this was awesome. I will warn you that Ms. King has an obsessive love affair with misplaced and unnecessary commas, as well as unnecessary hyphens, so expect it. Yes, she needs an editor. But her writing overall is so compelling even I was able to overlook it. And that is pretty darn special. Oh, and this is not the “meet the guy and hump him within five minutes” story. This is much, much better than that. Those are fine, in their place, but this is a real, honest to goodness novel with power to spare. There is a somewhat “HEA” … but I see a lot more in store for Blaze and Jack than some simple ending. A lot more. 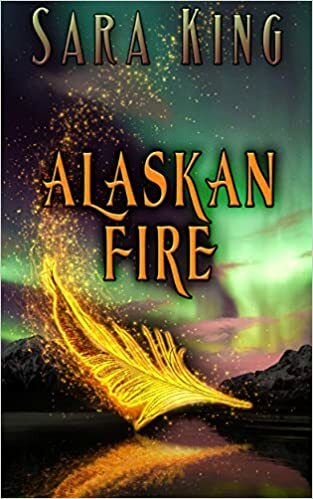 “Alaskan Fire” is the first of Sara King’s “Guardians of the First Realm” series. Book two is “Alaskan Fury” and I already have it downloaded. Here’s a hint for Were and Human alike – these are Kindle Unlimited, so what are you waiting for?! you wrote “I was truly surprised and thrilled to find a new-to-me author I am now so enthralled with.” and that’s such a wonderful feeling isn’t it. the joy of lots of new books you’re pretty sure you’ll love!! I’ve KU so I’m going to take a look at this thanks. Let me know what you think? Sometimes I have no idea why I truly like (or dislike) a book, I just do. Weird, I know, but I think this time I just felt so strongly about Blaze being so strong in some ways, and so dumb in others…. she just felt real to me. Of course, my housemate is also way tall and has size 11 men’s feet, so I sympathized! Love the cover, and also that for the second book – eye catching. I was surprised at how much I enjoyed it. I didn’t think I would at first because of Jack, but the more I read, the more addicted I became! I started Alaskan Fire last night and I’m hooked. So great to have a lead that’s not some sweet, tiny but incredibly beautiful lady, or a kick a ss one that still whimpers, falls in love at first sight and swoons at the feet of the seven foot supernatural hero. Jack and Blaze are a great pair. I’m about 1/3 in and loving it. Why is the best sellers dominated by Bella Forrest books and not ones like this? I admire what she’s done but look at top 100 in any of the paranormal selections and she’s got a stranglehold on it – I tried as they’re mostly KU, but after book one I realsied they just aren’t for me. an OK read but I didn’t want to continue. Hee Heee!!! SOOOOOOOOOOO glad you like it!! Looking forward to your review, Sweetie!